Learn to identify trees here. A tree root's effects on soil will vary depending on the type of tree as well as the type of soil. There are, however, a few things you should be aware of regarding your trees and how they may affect the soil they are in. These facts will have a direct impact on what else you can plant in the area surrounding your trees. Typically, a tree root's effects on soil will be an annoyance to many gardeners. Depending on the size of the tree, it will demand most of the water available in the soil, leaving other landscape plants thirsty. This is especially a problem with grass seed and sod. Trying to grow grass under a large tree is virtually impossible. This isn't all bad though. Mowing grass with large tree roots in the way isn't an easy task either. Unfortunately, this also means the soil will be so dry under your tree, you'll have nothing but unattractive dust for topsoil. Overall, if you have a healthy tree, you'll also have healthy soil. The two go hand-in-hand normally. In some cases, however, tree root's effects on soil can be negative. In some cases, some trees cause a phenomenon called allelopathy. Not all trees are allelopathic and not all allelopathic trees have their toxic chemicals secreted through their roots. The most commonly known tree with allelopathic properties is the black walnut. Black walnut trees produce a chemical called hydrojuglone which, when exposed to the soil or air, changes into the toxic chemical called juglone. 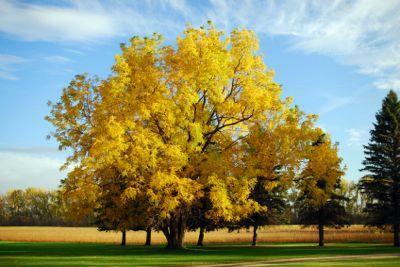 When other plants that are sensitive to juglone are planted near or under a black walnut tree, they turn yellow, wilt and eventually die. This happens when these plants just come within .5 to .25 inches of the tree roots. Effects on soil in this case is that it is, in a sense, infected with a highly toxic chemical. Black walnut isn't the only tree that produces juglone. This chemical is also secreted in smaller amounts by English walnut, hickory and pecan trees.Other trees with allelopathic properties include tree-of-heaven, sugar maple, hackberry, American sycamore, American elm, southern wax myrtle, cottonwood, black cherry, sassafras, red oak and black locust. It is important to realize though, that these other trees do not all secrete the same chemical, nor is the chemical always secreted through the tree roots. Effects on soil may be due to leaves that have dropped on the ground and decomposed. If you have large trees, it isn't reasonable to just remove them all from your landscape just because they have allelopathic properties. There are a few things you can do to enjoy your trees without worrying about the tree root's effects on soil in your garden. Keep your soil healthy by adding plenty of organic mater on a regular basis. Organic matter, in the form of compost, will aid drainage and aeration while also increasing the population of microorganisms that your soil needs.This is wise no matter what you are growing, from trees to vegetables. Compost is great for your soil and worth and extra effort. It will also break down any toxin that may be present in the plant materials you've put in your compost pile. You'll be rewarded with a healthy, beautiful landscape if you are diligent about adding compost on a regular basis. ...and a wide variety of other trees, shrubs and flowers. Just because you have black walnuts, or other allelopathic types of trees, the tree root's effects on soil doesn't have to limit your landscape possibilities.